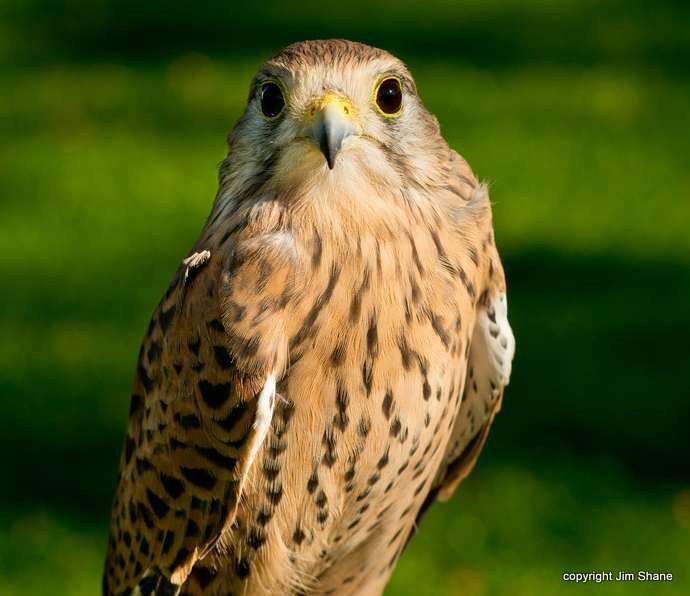 In the sport of falconry during the Middle Ages, Merlins were flown in spectacular ringing flights in pursuit of Skylarks by the ladies of the court. Falconers call the male Merlin a jack. Previously this falcon was called "Pigeon Hawk." The Peregrine Fund does not work directly with Merlins, but our efforts in scientific research, habitat conservation, education, and community development help conserve birds of prey around the world. We also supply literature to researchers from our avian research library, which helps scientists around the world gather and share important information on raptor conservation. Studying the distribution of the Merlin would make anyone an expert in geography. These smallish falcons are quite the "world travelers." Though not as widely distributed as Peregrine Falcons or Osprey, Merlins can be found in many regions of the world. During the breeding season, they range in North America from northwestern Alaska east through most of Canada to Newfoundland, and south to the northern United States, breeding in such states as Idaho, Oregon, Wyoming, and Minnesota. The northern Eurasian population can be found from Scandinavia to Sibera, south to the British Isles, and east to northern China. In the winter, these birds really begin to move. Individuals in the Western Hemisphere migrate south to the United States or head to sunny Caribbean islands, such as Cuba, the Bahamas or Hispaniola, or go further south into Central America and South America. In the Eastern Hemisphere, they travel throughout Europe and some head to southeast Asia, including India, and northern Africa, including Tunisia. During breeding season, this cosmopolitan falcon is found mostly in open country, including taiga, plains, and prairies, but it also can be located at the edges of coniferous woodlands, wooded steppe, and occasionally in suburban habitats. During winter, it prefers open areas with scattered groups of trees, including parks and orchards. It also can be found in marshlands and river valleys. These falcons tend to avoid very dense forest. Though only a bit larger than the American Kestrel, the Merlin is much heavier and more robustly built. As is most raptor species, the female is larger than the male. Female and male Merlins also differ in coloration. Male Merlins have bluish to silvery gray backs and their breasts and flanks are buffy colored with heavy black-red-brown streaking. Females and juveniles have grayish to dark brown backs and buffy white with brownish spots on their undersides. 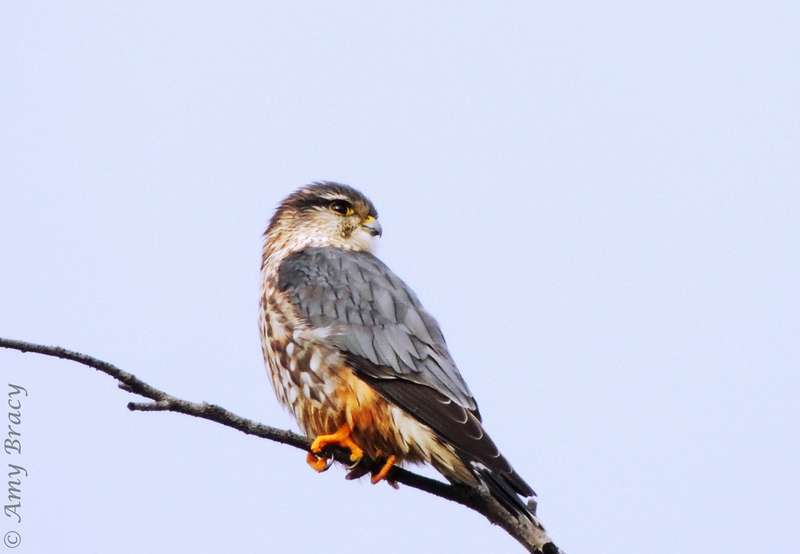 Merlins are migratory species and, though they normally roost solo, they may roost in small groups in winter. 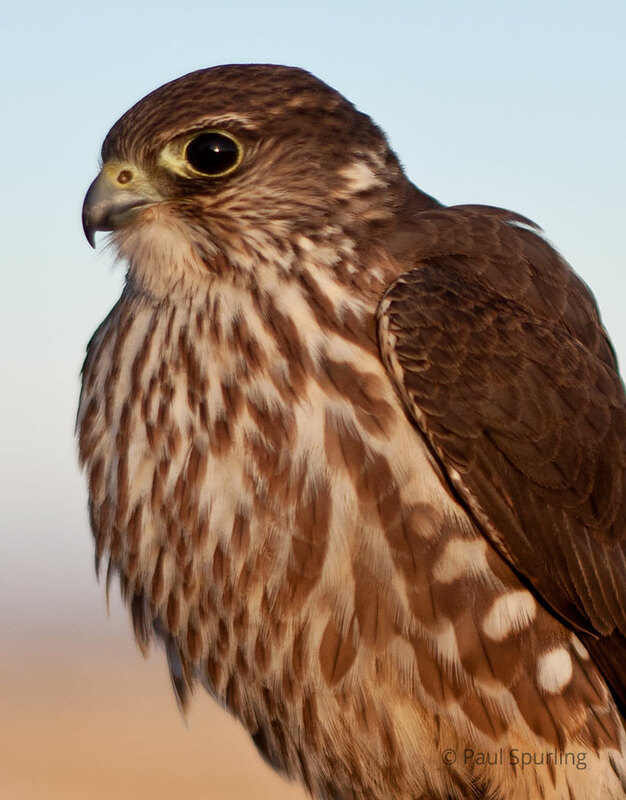 Like so many other raptor species, the Merlin suffered significant declines in the 1960s and 1970s due to the effects of the pesticide DDT. Merlin populations have recovered over the decades since use of the chemical was banned and now are considered stable or increasing throughout most of their range. 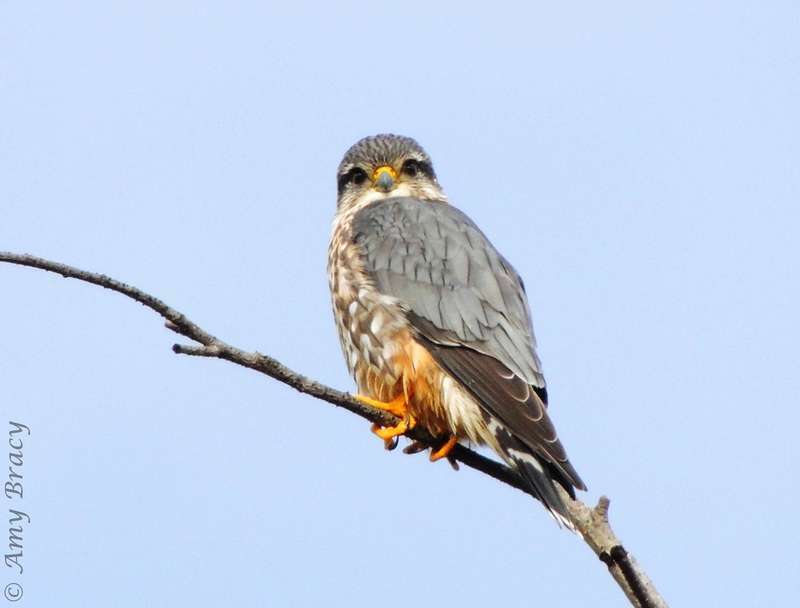 Scientists recently documented that the breeding range of North American Merlins has expanded. For example, the species now nests regularly in New England, whereas before it only migrated through. One possible cause for this success has been the species' ability to move into urban habitats to hunt small birds at backyard bird feeders. Though Merlin populations are currently stable, they still suffer losses from predation and collisions with powerlines or vehicles. Merlins, like all falcons, use speed and agillity to capture their prey. Their staple foods are small- to medium-sized birds, including larks, pipits, and house sparrows. They also take birds that are a bit larger, such as sandpipers and pigeons. Apart from pursuing feathered prey, they hunt a wide variety of other animals, including bats, insects, reptiles and small rodents. Merlins use a variety of hunting techniques to catch a meal. They most often catch prey in the air after swooping from a perch or while flying low over the ground in a surprise attack. Occasionally, they flush hiding prey out from shrubs or glass clumps and then pursue it in a tail chase. If there is a surplus of food, prey may be cached, or hidden at the nest or in a clump of vegetation, and eaten later. 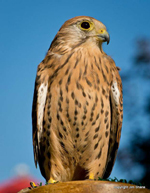 Like most other falcons, including the Orange-breasted Falcon, Merlins do not build their own nests. Instead, they use old stick nests built by crows, magpies, or hawks. Sometimes, they nest on cliff ledges, tree cavities or in simple scrapes on the ground. The female lays 3-6 rusty brown eggs with brown markings. The eggs must be incubated for about 27-32 days. Though the male helps out from time to time, the female does the majority the incubation, which means she must sit on her eggs for the better part of the day every day – in rain, extreme heat, wind or other harsh condition. After the chicks hatch, the female broods her young until they can control their own body temperatures, meaning that she must continue to sit and shelter them from extreme heat, cold, rain or other weather conditions. While incubation is a tough job, the male also works very hard to care for his young. He provides all the food for the female while she is incubating and then for the female and their young until the nestlings no longer need to be constantly brooded. The young leave the nest about a month after hatching. This is a relatively easy time for them because the parents bring them food and defend them against predators. However, they still face many risks. As they learn to hunt, they sometimes accidentally crash into fences or are hit by cars. If they spend too much time on the ground, they are vulnerable to predators, such as bobcats and coyotes. Even up in a tree, they might fall prey to snakes. When flying, they are vulnerable to capture by Red-tailed Hawks, Great Horned Owls, and other birds of prey. If a young falcon can survive the first year of life, chances are good that it will be able to survive into adulthood and raise young of its own. About 5 weeks after fledging, the young merlins leave their parents' territory and begin life on their own. 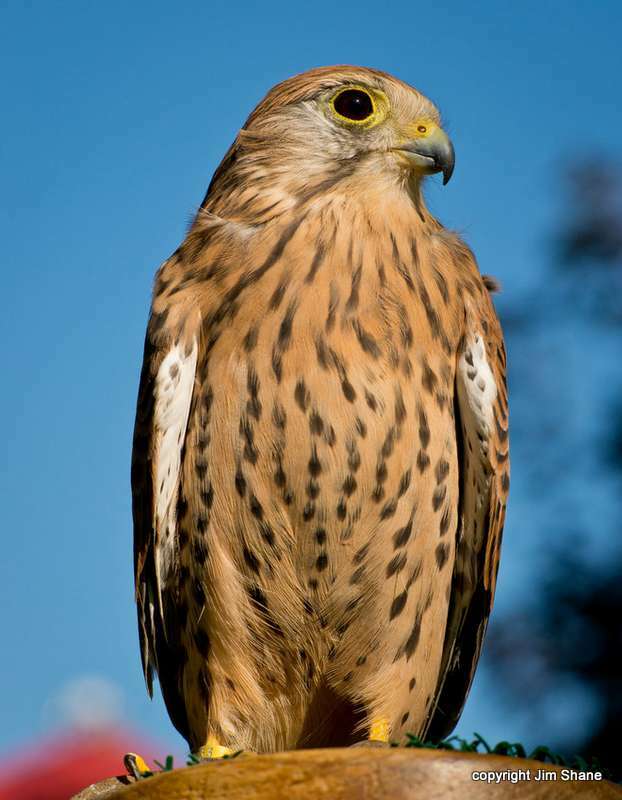 Merlins rarely breed in Idaho, but nests have been discovered in the southeastern and northern parts of the state. They commonly migrate to Idaho in winter and are considered a locally abundant winter resident. During winter, Merlins occassionally spend time on the grounds of The Peregrine Fund's World Center for Birds of Prey. A visit to our visitor center may reward you with a glimpse of one of these falcons perched in a nearby tree, along a fence post, or hunting in the open fields around the Velma Morrison Interpretive Center. The World Center for Birds of Prey offers fun ways to learn about birds of prey. The visitor center has interactive displays, tours, interesting videos and a children's room with activities from coloring sheets to quizzes to costumes and a touch table for the curious mind. We also have several different birds of prey on display year-round. Knowledgeable staff and volunteers are on hand to answer any questions you may have about Merlins or any other birds of prey.